Thank you very much for this recipe, looks delicious dish, I prepare for my family. It equals out to about 8 vanilla beans, and won’t dry out like v. beans will over time! AAAAH, that looks so, so, SO good. I love cheesecake and I love real vanilla beans. I must try this as soon as possible. Thanks! 🙂 Great pictures by the way. This cheesecake looks wonderful, I suspect I shall be making it for my pops come his next birthday. 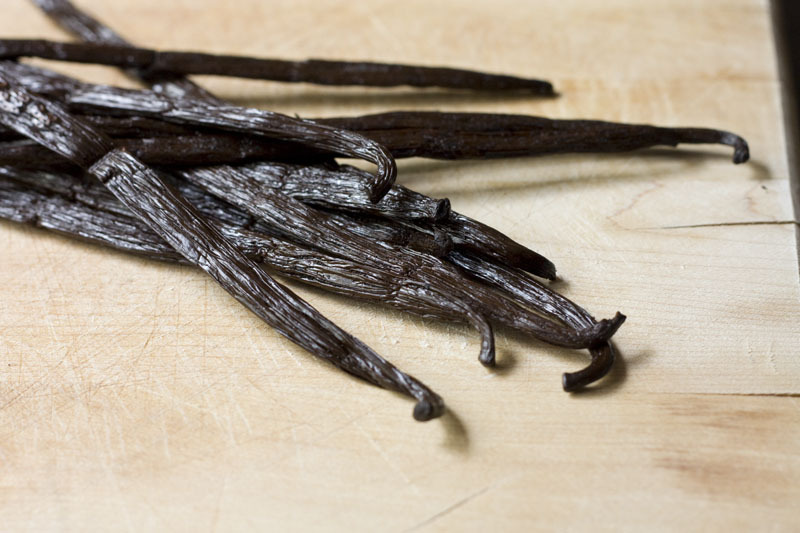 Can you post a link to the site where you purchased the vanilla beans? I need to replenish my supply of homemade vanilla extract and I’m seriously dragging my feet because of the exorbitant in-store cost of the beans. This looks amazing!! I love vanilla bean, too. I bought 1/4 pound of vanilla beans (around 30-40 beans) for only 4-5 dollars on eBay. I still have a bunch left after about one year of purchase, and I’ve made a lot of vanilla bean ice cream. 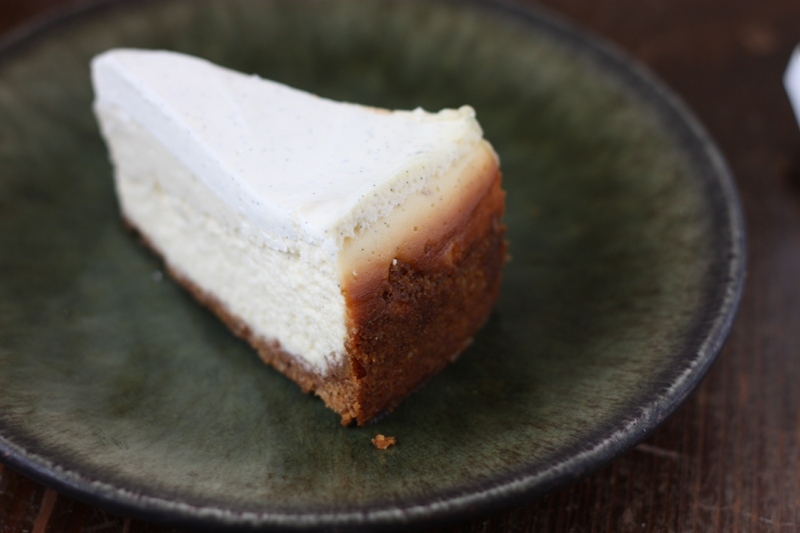 This cheesecake is next on the list! Thanks everyone! If you do try it, let me know what you think! Kitty – I got my beans on Amazon here – they were great and they’re even cheaper if you buy larger quantities. I bet you could also get good ones from Penzeys, although I haven’t tried those. I must say that cheesecake looks mighty fetching. It makes my mouth water! Looks absolutely amazing! I love the little black dots that the vanilla bean leaves behind, it reminds me that I’m eating something really special. This was a big success and everyone loved it at the office. It was gone before I knew it. I was out of Graham crackers so I used Oreos instead and it was awesome. Great opportunity to showcase those vanilla beans. I made this recipe recently, and I found that, while the texture/consistency was perfect, it was much too tart for my liking, and the vanilla flavor was overpowered by the lemon juice. I would love to try this again without the lemon juice, but am afraid that omitting it may affect the consistency. Do you have any suggestions for me? Danielle – sorry it was too tart! It might be better with the juice of half a lemon, I’ll adjust the recipe. It’s actually probably also fine to omit it entirely. If you find that the filling is a little too stiff without the liquid, you can add in some heavy cream to make up the difference. Oh, no need to be sorry! I actually thought about only using half the lemon, but thought the filling was too thick, so that’s why I added the rest, but next time I will add some cream to it. Other than the tartness, it was awesome, so I will adjust to my taste! I made this last weekend b/c my hubby LOVES the vanilla bean cheesecake from cheesecake factory. 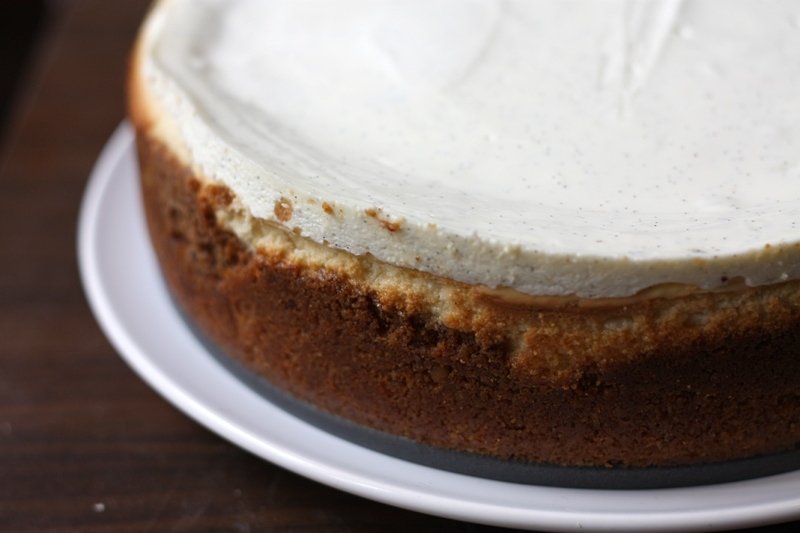 He said this was the best cheesecake he has ever had – so did my family and Im told I have to make it again for Thanksgiving. Thanks so much for this! Making this for Thanksgiving, it’s in the oven now. Silly me didn’t read the whole post before going to the grocery store and experiencing sticker shock at the price of Vanilla Beans. So I had to shell out lots of moolah, but next time I’ll know better. (By the way, what is the best way to scrape out the seeds? I did what I could to get as much as I could about those pricey little things…didn’t know if there was a certain no-fail way…). On to my real question, you say, “Cover the cake pan with a lid,” What does that mean? Put a lid on the cheesecake while it is cooking??? I’ve made tons of cheesecakes and never covered one with a lid while it was cooking. I didn’t cover it, but I just wanted to clarify that part. Can’t wait to try it!!! The best way I’ve found to scrape the caviar out is to use a sharp knife to slice it (not all the way through) lengthwise from top to bottom, then turn the knife dull side down, get into the groove, and scrape. You might have to do it twice, under each flap. I hope that makes sense. I would like to give this as a gift. Do you have any tips on how to remove it from the springform pan, especially the bottom? Thanks. When you get a chance would love your opinion on my new company that I’ve created. It’s called Nick Knack Cheesecake on Facebook. I get grade A vanilla beans on eBay and Amazon for $16.99 for 50! They come vacuumed sealed and super soft! Thanks for sharing about the vanilla beans lien. They are expensive at giant I forget how much but you only get 2. 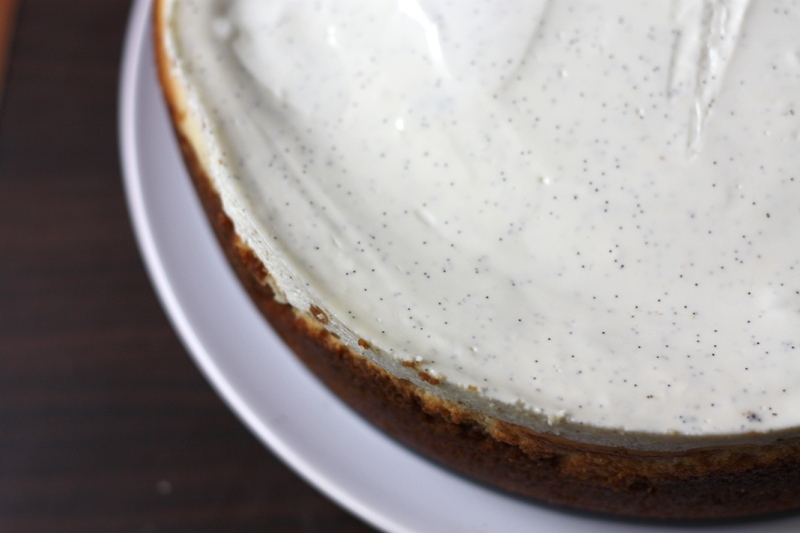 You are currently reading vanilla bean cheesecake at one cake two cake.